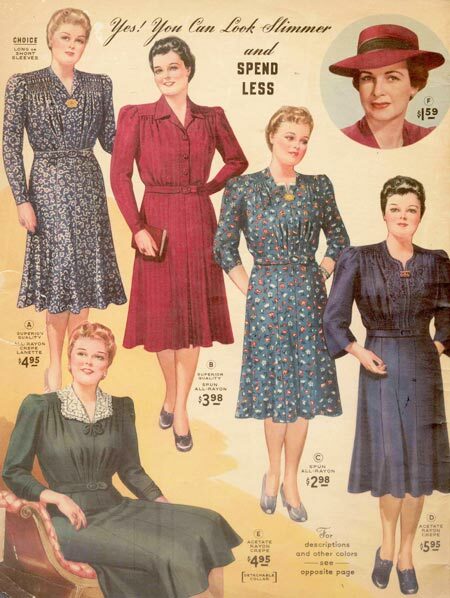 One of the myths of vintage clothing is that it's all so small. There are a few reasons why this seems to be. All of these speculations had some impact on the size of existing vintage and antique clothes. However, Doris Langley Moore long ago refuted much of these claims by measuring and comparing extant Victorian garments and reporting an average 26-inch waist - a modern size 6. We recently cataloged an 1870s silk ensemble with a 41-inch bust and 33-inch waist, close to a modern size 16. Not everybody was tiny. And this catalog of 1941 Lane Bryant fashions shows many more recent vintage clothes in "stout" yet "slenderizing" examples. 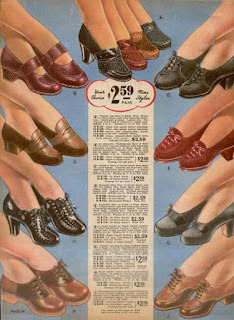 The history of Lane Bryant with its initial focus on maternity wear, surpassed in the 1920s by the demand for plus-size clothing, bears out the real need for mass production of larger women's clothes early in the last century. 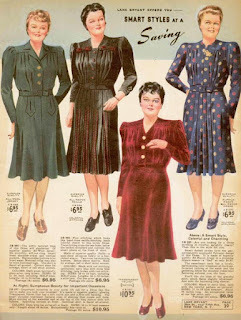 Sales of plus-size women's clothing exceeded half of Lane Bryant's $5 million revenue in 1923.
women's sizes 12 to 40 today. Even the shoes offered a generous range of sizes, from 4 to 11. 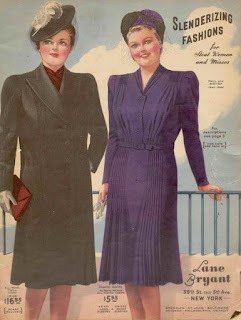 Lane Bryant was a single source for plus-size women over the last century, including everything from underwear to hats and bathrobes for larger ladies.